Ford GoBike (previously Bay Area Bike Share) is a membership-based transportation service, which allows members to make point-to-point trips using shared bicycles. The City of Oakland will host 850 bikes and 70 stations on streets, sidewalks and public plazas by the end of 2017. As a regional program, the cities of San Francisco, San Jose, Emeryville, and Berkeley, will also have shared bicycles for use under one membership. 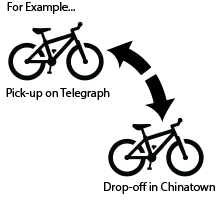 Bike share pricing is set up for short-term, point-to-point trips like the example to the right. If you plan on using a bicycle for an extended period of time, we encourage you to rent a bike at a local bike shop or rental business. 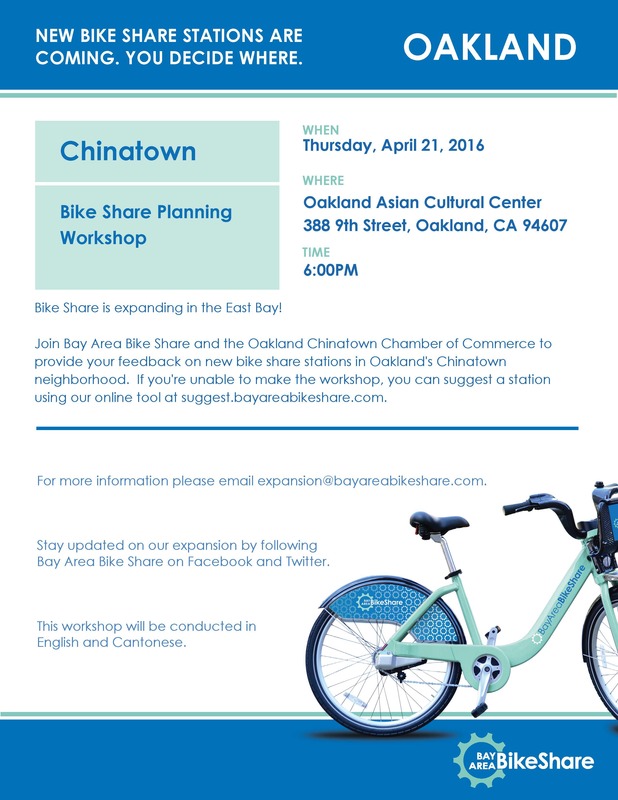 Click here to see a list of bike shops in Oakland. Visit the Ford GoBike website to sign up today as a member. Members who qualify for the PG&E’s CARE (California Alternate Rates for Energy) or Cal Fresh SNAP program qualify for the low-income reduced-price membership. Cash payment centers are also available on the Reduced Fare Program web page. Experience from other cities has shown that bike sharing stations should be spaced on average every few blocks throughout the service area. When determining station locations, the City considered topography, job centers, transit connections, proximity to the bikeway network and general support of station placement from neighbors. Ford GoBike also used an online crowdsourcing tool to help select the location of East Bay stations. Station locations are also prioritized to complement regional transportation stations such as BART and AC Transit stops. The full 70-station system will be implemented in three phases and is expected to be complete by the end of 2017. 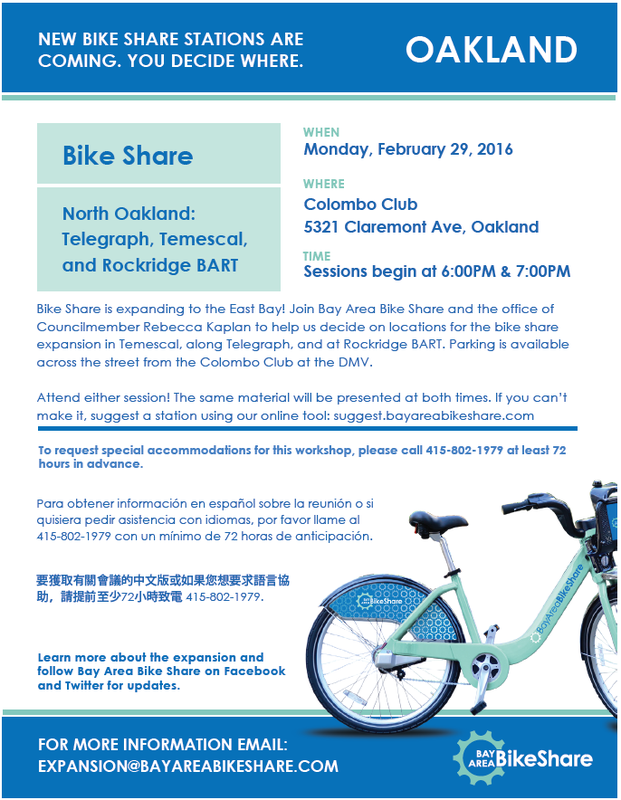 Bay Area Bike Share was officially launched in the San Francisco Bay Area in August 2013. The pilot program included 700 bikes and 70 stations in San Francisco, San Jose, Redwood City, Palo Alto and Mountain View. As of March 1, 2015, the system yielded a total of 485,000 trips in the five pilot cities; riders in San Francisco took 436,000 trips overall, 90 percent of the total. In February of 2015, "Motivate," the private company that is the current bike share vendor for the Bay Area Bike Share program, made an unsolicited proposal to the Metropolitan Transportation Commission (MTC) and select Bay Area cities to be the exclusive supplier and operator of bike share in the Bay Area at no public cost. Motivate's proposal for the Bay Area includes an expansion of the existing system to a total of 7,000 bikes throughout the region with 850 new bikes in 70 new stations to be located in Oakland. MTC entered into an agreement with Motivate as the exclusive supplier and operator of bike share in the Bay Area on May 27, 2015. The Ford Motor Company is the title sponsor for the program. July 11, 2017 Ford GoBike program begins in Oakland, Berkeley, and Emeryville. June 26, 2017 Ford GoBike program begins in San Francisco and San Jose. February 2, 2016 City signs Resolution No. 85965 C.M.S. authorizing the City Administrator to accept and appropriate any shared revenue and liquidated damages from the bike share program. February 2, 2016 City signs Ordinance No. 13354 C.M.S. to amend the Municipal Code to allow for encroachment of a bike sharing station and amend the Master Fee Schedule to establish new fees for bike share encroachment permits. February 2, 2016 City signs Ordinance No. 13355 C.M.S., granting a Franchise Agreement to Bay Area Motivate, LLC. to operate a bike share program. July 2, 2015 City Council approved Resolution No. 85715 C.M.S. to adopt a Bike Sharing Policy and authorize the City Administrator to negotiate and enter into an Intergovernmental Agreement with the MTC. To report an issue with the bike share station (graffiti, debris, etc. ), contact customerservice@fordgobike.com. For corporate partnerships, sponsorships, marketing and media inquiries, visit the Ford GoBike website.